Yeshiva World News reports on the death of Rav Nachman Mandel, of Los Angeles today. Rav Nachman Mandel was my first grade Rebbe in HILI way back in 1975-76. It should be noted that while I went to a frum yeshiva, my family and I were not frum at the time. Even so, Rabbi Mandel treated me no different from any of the other children in the class. I was never singled out for my lack of Shabbos observance. He always took great care to see to it that my parents were never put down in front of me for their lack of being frum. In short, I learned chumash, halacha, etc. with the rest of the class. Did it cause some problems learning that watching TV was forbidden on Shabbos when it was done in the home? Yeah, it was a bit of a disconnect, but I managed to survive. Rabbi Mandel was an influence on me for the remainder of my life. I only saw him once or twice after that first grade year (My family moved to New Jersey the following year), but yet, he still continued to exert a positive influence not only on me but also on my mother as well. She credits him as one of the reasons why she is frum today -- and me by extension. It seems odd to reflect on the fact that 30 years ago, a frum yeshiva allowed a kid who was not Shomer Shabbos into the school. To my knowledge, none of my classmate's parents called the school to complain. I wasn't banned from playing with any of my classmates. I (and my family) were simply accepted as a part of the group. I don't know if Rabbi Mandel had any say about my being in his class, but if he did, then he was one who understood that in order to be m'karev people, you have to draw them close, not drive them away. He (and the yeshiva administration) saw the potential in our family, and chose to act kindly and mentchlichkeit. Rather than turn us away from the yeshiva, they opened their doors, and because of that decision, a child who wasn't frum in their first grade class is a Shomer Torah U'Mitzvos today. I still, to this day, have many memories about Rabbi Mandel's class. To my knowledge, he never became angry at the children and tried to engage them at whatever level they were at. I remember one time, we were learning Chumash. Well, at least the class was -- I, on the other hand, wasn't paying much attention. My attention was captured by the chart above the blackboard listing all the parshiyos of the Torah. While my Hebrew reading skills were okay for a first grader, but there were still some words that stumped me. And so, right in the middle of chumash class, I raised my hand and asked the rebbe how to pronounce the second to last parsha in Sefer Sh'mos. Even though this clearly gave away the fact that I was not paying attention to the lesson, nonetheless, with love and calmness, he answered my question ("Vayakhel") without any trace of anger. Rabbi Mandel was the first person who made me aware of tefillin. My father didn't even own a set of tefillin, so I had never seen one. Perhaps that's why one day he took off his jacket and showed the class the marks that were left behind on his arm by the leather straps. Thinking back on it, I'm almost certain that it was done mostly for my benefit -- I'm certain that just about the entire rest of the class had seen their fathers putting on tefillin. Rabbi Mandel gave out stars as rewards for learning. I still remember with fondness the small oaktag squares with the stamped stars on them. Even rarer were the ones with a five on them, indicating that it was worth five stars. Every month, he would take out a bunch of toys and "sell" them to the boys in exchange for the stars. In addition, he also made sure that every boy in the class got *something*, even if they didn't have any stars that month. Another fond memory of Rabbi Mandel was the fact that he always made sure to call me by both my Hebrew names. I asked him about this and he explained to me that my Hebrew names came from two different people. However, to call me by just one would be, in a way, showing disrespect to the person from whom my second name derives. In order to honor both people, he said, he called me by both names. That was a powerful lesson that stuck with me though the years. When my kids were younger I used to call them by their full names, specifically because I was taught to do so by Rabbi Mandel. While I can't say that I still do so 100% of the time, I still try to call them by their full names as often as possible. Lastly, I remember that I once won a siddur as a prize in first grade. Rabbi Mandel decorated the inside of the cover with my name. I still have that siddur today, partly as a reminder of the kindness that Rabbi Mandel showed toward us. The love and caring that Rabbi Mandel showed me has stayed with me for many years. It was his tolerance of a non-frum kid in his class, and his ability to look beyond that fact and still show love and caring that was a major factor in my being observant today. If more yeshivas would have the approach that Rabbi Mandel used thirty some odd years ago, there might be many more Jews who are Shomer Torah U'Mitzvos in the world today. We're all pretty familiar with the way that Rosh Chodesh worked in the times of the Temple... two men would go to a court in Jerusalem and testify that they saw the cresent of the new moon. After examination, the court would announce that the day is Rosh Chodesh (the first day of the new month).However, for those of us who aren't seasoned astronomers, we really have little idea what it means to see the new moon. Most of us don't even notice it until a day or two after the molad, as a thin crescent in the western sky at night shortly after sunset. But what does the moon look like shortly after the molad? How difficult is it to spot the moon after the molad? This photo (taken by Laurent Laveder) shows the moon a mere 15 hours and 38 minutes after the molad. Finding the cresent when it is less than 24 hours is very difficult and requires planning. This is the youngest moon that Laveder has ever recorded. 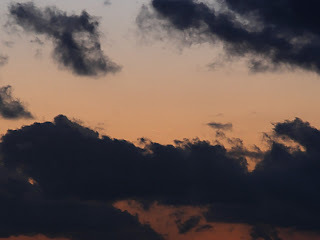 As you can see from the picture, it is very difficult to spot the new moon (it is the barely-visible cresent above the dark cloud in the center of the picture). This is what the witnesses went looking for when they scanned the skies in order to give testimony about the new month. Rabbi Horowitz asked me to bring up this topic on my blog. There are lots of kids in our communities who live in single parent households. While, thank God, I have never been a single parent, I have known quite a few. These people (usually, but not exclusively, mothers) put in long, hard hours trying to raise kids while holding down a job (and possibly even going to school). How they find the strength to do this I don't know -- but they do it simply because they have to. However tough it is on the single parents, it's also difficult for the kids. Kids from single parent families know (very keenly) that their family is different from other families. Very often, they are ashamed of the fact -- even though they are not at fault for the condition. It's a terrible thing for a kid to live with that sort of shame. It manifests itself in various ways. In a mother-only household, the boy may watch with envy as his friends sit with their fathers in shul and he sits alone. He sees his friends go to father-son learning programs on Saturday night, and he either has to make do with a tutor, a "lesser" relative, or simply not go at all. In single-father households, girls often miss out on the mother-daughter activities that schools have. Boys and girls need positive role models from both genders, and sometimes, for whatever reason, it just isn't present. I know of this because I grew up in a single-parent household. My parents separated when I was nine years old. My mother moved to Brooklyn and became a ba'alas t'shuva, and Skipper and I did so along with her. My father continued to remain as he was -- not frum. So, in a biological sense, I had no frum male role model. I did have two frum male relatives, but neither were very accessible to me as a kid -- either they lived too far away from me or were just too old to really relate to me on a personal level. As such, when we first moved to Brooklyn, I went to shul alone. Sitting by yourself in shul on a Shabbos morning with a bunch of older men whom you don't know can be pretty intimidating as a nine or ten year old. Sure, I knew that my mother was sitting right behind the mechitza, but, since she couldn't sit with me, it didn't help much - she might as well have been on Jupiter. As it turns out, I soon made some friends of kids my own age in the shul. It certainly helps for a kid to have friends. However, it also helps even more when those friends have caring fathers. My friends' fathers in many ways took me under their wing. Skipper and I were often welcome by their houses. We ate Shabbos and Yom Tov meals with their kids, celebrated Pesach sedarim with them, went places with them, etc. I know that each of them cared for Skipper and I and always looked out for our wellbeing. In some ways, these three* men became surrogate frum role-models/father figures for me. Two of these men are gone now. One of them even passed away on the same day as my father's father (imagine having two funerals to go to on the first day of Chol HaMoed Pesach). I still miss them very much. One is still around -- I think I'll give him a call soon. The point, I suppose, is this. I know that kids from single-parent households can be embarrassed about their home situation. 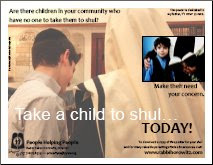 They can be afraid or ashamed to go to shul without their father or mother. They can be angry and/or upset that they can't participate in the father-son/mother-daughter activities that are prevalent in our communities. I know this because I *was* that kid. I was that kid who didn't have a father who could help me with my Gemara learning. I was that kid who didn't have a father (or older brother) to sit with in shul. I was that kid who never saw his father make a seder. I was that kid who hid the fact that his parents were no longer married from his classmates/bunkmates. And I was the kid who needed someone to step up and help out. I thank God that Mr. N a"h, Mr. E a"h and Mr. P (in no particular order) were there for me to help me in that crucial stage of my life. What we need today is more men (and women) like them -- people who will take an interest in the kids in our community who don't have a positive role-model of the appropriate gender to look out for them. * That's not to say that other people haven't taken us (as a family) under their wing. Many people helped my mother, Skipper and I on our path toward frumkeit, each in their own way. And certainly, many of them showed kindness to me (as a kid) along the way. But those three were certainly the ones I was closest to as a kid growing up. The others came along after I was already more confident in my yiddishkeit and at a point where I was a little older and wasn't afraid to go to shul alone and at a point where I was no longer embarrased/ashamed about my home situation. Last week, a disturbance occurred on board an El Al flight going from Tel Aviv to Uman, Ukraine. The problem began when the flight crew began to bring the movie screens down in order to show an in-flight movie. Several Chareidi men on the plane began to go wild, shouting and physically trying to prevent the screens from unfolding. As the story goes, some of them were promised when they booked the flight that there would be no in-flight movie. I'm not sure how the airline could promise such a thing to some customers and not to all, but let's put that aside for the moment and assume that there was a bona fide promise. It still seems to me that rioting, shouting and physically interfereing with the equipment is not the best way to handle the situation (and, in fact, given the nature of air travel today, is a completely unacceptable way to handle it). If it were me (and, of course, assuming that I was careful not to watch movies and had been promised that no movies would be shown), this is how I would have handled it. When the announcement of the movie was made, I would have brought it to the attention of the flight crew that a promise was made that there would be no in-flight movie. I would make my case forcefully and strongly... but respectfully. If that did the job, all well. If not, I would reiterate it, along with a threat to take the matter up with her superiors once the plane lands. I'd also make it clear that I plan to publicize the breach of contract on the airline's part to every news outlet and religious community that I could reach out to. But at no point would I become violent. At no point would I start shouting. And at no point would I attempt to interfere with the operation of the plane (including the movie equipment). If I fail in all my attempts on the plane to stop the movie, then that's it -- there is not much more to be done on the flight. I'd simply advise the crew again that I will be filing a formal complaint and simply sit down and not watch the movie. Of course, once we landed, I would take up the matter with the airline and proceed from there. One commentator on Yeshiva World actually wants El Al to apologize to the Chareidim for putting them at risk of being shot by an air marshal! I don't know what the commentator is smoking, but my personal view is that if one of them were shot by an air marshal while rioting, it would largely be his own fault, not the fault of the airline. There is nothing that says that a person is required to riot to prevent a movie from being seen. That being said, however, I think that there is a larger issue here -- the imposition of one's standards on other people. It should be fairly obvious from the story that this flight had a scheduled in-flight movie. As such, I don't see how El Al could promise a group of people that there would be no movie without taking the movie away from the paying customers who were looking forward to a movie on the long flight. By demanding that no movie to be shown, they were simply imposing their standards on people who do not accept them. Of course, El Al can make an accommodation and provide non-movie flights -- but that has to be an economic decision of the airline. Just like I can't *force* American Airlines to provide a kosher meal, no one can *force* El Al to not show movies. I wonder how it is, however, that one comes to the conclusion that you can even ask a company to change it's policy just for your benefit. For example, this flight had an in-flight movie. While it's one thing to ask if there are any no-movie flights (and, perhaps, to suggest that the airline can make some money if they do institute such flights), I don't see how they can expect the airline to cancel an already-scheduled movie just at the request of one (or a few) passenger(s). After all, other people who have already booked the flight have paid for the right to have an in-flight movie. It's similar to my asking American Airlines to make sure that only kosher food is available on a flight -- not just for me, but for everyone else. Of course, American isn't required to make that accommodation solely for me and I have no right to expect it (and certainly no right to riot when I find out that my Irish neighbor is having a ham sandwich for lunch). If you're starting to get that feeling of deja vu, it's with good reason. After all, we've been through all this before. Not with airplanes, but with buses in Israel. While it's one thing to have Mehadrin buses, where the genders sit separately, it's far beyond the pale to demand that the gender's sit apart on non-Mehadrin buses. That is another example of one group seeking to impose its standards on a larger population. Personally, I find it disturbing that groups seek to do this. Apparently, they have the idea that their way is THE way and that there is no possibility of anyone else's way possibly being acceptable as well. Bottom line is this: If El Al promised these people a no-movie flight, then they are owed an apology for the breaking of that promise. But the rioting people also owe an apology to every other passenger on the flight for their rude and crude behavior. I don't know how old the doctrine of rabbinic infallibility is, nor exactly how widespread it is. It certainly seems to have been with us for quite a while and also seems to be well entrenched in some of our communities. However, it's clearly not universally held. There are plenty of people in the Orthodox community who maintain that rabbanim can and do make mistakes. Even the gadol hador (no, not the blogger... we all *know* he's infallible. :) ) can make a mistake. This idea has clear support from the Torah, Navi, Mishna and the Gemara. In any event, I was giving the matter of rabbinic infallibility some thought when I happened to listen to a lecture on the Kuzari Principle. The Kuzari Principle (in short, oversimplified form) states that the events of Mt. Sinai must be true because the entire nation witnessed it and passed the story of the Revelation to their children and grandchildren who, in turn, passed it along to their descendants, and so on. Had someone else invented the story of the Sinatic Revelation after the fact, the people would have rejected it saying "my father never told me that story." While it's certainly not a perfect proof to the factuality of the Sinatic Revelation, it's not a bad argument either. However, it occurred to me that the doctrine of rabbinic infallibility actually wipes out the Kuzari Principle. If one accepts the premise that the leader or leaders of the generation are incapable of making an error, then it follows that they can formulate new traditions and have them be accepted by the masses. The fact that the audience did not receive these traditions from the ancestors won't matter. Just to take an extreme (and silly) example: Suppose a gadol announces that this year that everyone must, after eating the matzah at the seder, stand up and do the Macarena. He announces that he found sources which indicate that this practice is correct and should be done. Now, if you're going to posit that the rabbinic authority is always correct ("He's the gadol hador. Just listen to him. Be m'vatel your da'as to da'as torah.") then it does not matter that the people doing the Macarena this year never heard of this from their fathers or father's fathers -- they're going to take the gadol's word for it since he is infallible. But this scenario is exactly the sort of thing that undercuts the Kuzari Principle. The Kuzari Principle rests on the assumption that no one can introduce a new "history" to the nation because the check against that happening is the collective memory of the nation; but by granting someone the power to be infallible, you are giving them the ability to invent a new history and have it accepted despite the collective memory of the population saying otherwise. Therefore, in any system where the Kuzari Prinicple is accepted, human infallibility cannot exist. I've been doing some thinking lately. A lot of thinking. There has been a lot that has been going on in the Jewish world over the last few years. Before I started this blog, I had no idea of the world out there. Sure, I knew that there were some ultra-fundamentalists who had world views that were completely outdated, outmoded and just flat out wrong. But until I started this blog, I was truly sheltered. The degree of fundamentalism that I have encountered since I started the blog has far outweighed anything that I might have encountered only a short three years ago when I was safely ensconced in my own little corner of Brooklyn with no real knowledge of the outside world. And yet, when I look at the fundamentalist viewpoint of the world, I find a certain... peacefulness about it. One doesn't have to worry about which school to send your kid to - you just follow your leaders and the rest of the community. One doesn't have to worry about which candidate to vote for -- you just vote for whomever your Rosh Yeshiva/Rebbe tells you to vote for. You don't have to worry about whether or not to buy a house -- just ask Da'as Torah. Heck, you don't even have to worry about whether to buy the blue dishtowels or the yellow ones -- just ask your Rav. The possibility of just abdicating any responsibility of thinking and just "go with the flow;" of just letting your Rabbeim and Rabbannan dictate your life for you and relieve you of the obligations of intelligent choice is sometimes very luring and seductive. I've tried, over the last three years, to show that intelligent choice is the correct way to live life. I've tried to make the point that one has a responsibility to look at the options that are available (within the confines of halacha, of course) that are available to one in life and to become informed and make intelligent choices regarding the path that he or she will follow in life. But I'm tired. I'm tired of bashing my head against the wall at fundamentalists who insist that Da'as Torah knows better. I've become weary of repeating my points over and over again. I have no more to say. I simply can't go on -- the spirit it done, the fire has gone out, the drive just does not exist anymore. The other side has won -- I've been seduced into ennui, into non-thinking, into abandoning any rational thought process. I don't have the mental strength to engage in the soul-searching that is necessary to live a thoughtful, intelligent life. And so, I am surrendering myself to Rabbinic dictates. No more will I question the words of an ordained Rabbinic authority. No more will I exhibit the trait of independent thought. No more will I complain at decrees that I find unpalatable -- indeed I will render myself incapable of finding them unpalatable. I will completely surrender myself to their will. The faces of the Rabbis loom large over me and I feel my eyes fill with tears of joy and reconciliation. The last lesson had been learnt. I love the Rabbanim.